For example, we have 5 statements inside the loop and we want to exit from the loop when certain condition is True otherwise, it has to execute all of them. In these situations we can place the Break statement inside the If condition. 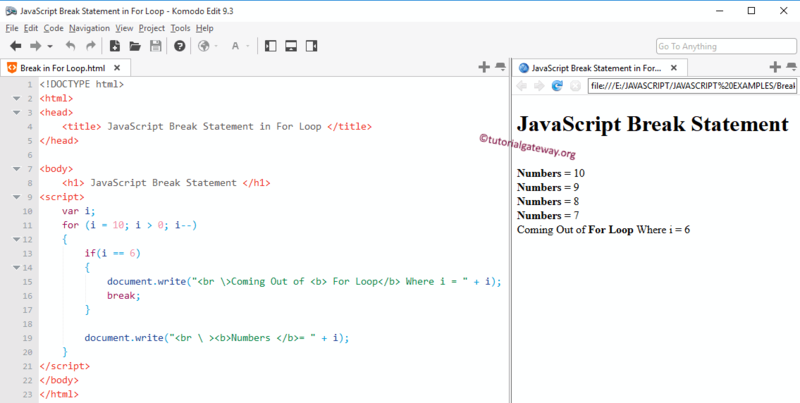 If the condition is True then compiler will execute the break statement it means, the break statement will completely exit the controller from the loop otherwise, it will execute all the statements. Inside the While loop we placed if statement to test whether I is equal to 4. If the condition is false then it will skip the Break statement and prints that number as output (In Our case 0, 1, 2, 3).